Special thanks to Sweet-i Dessert House for extending this food review invitation. Sweet-i Dessert House (甜在心糖水屋) has recently moved from Taman Lip Sin to a new shop at D'Piazza. Tracing its humble beginnings as a roadside stall in 2005, this dessert shop specializes in tong sui (糖水) desserts. One of the bestselling desserts since Sweet-i's inception is Ginkgo Nut Barley (银杏薏米腐竹浆, RM4.50). Using barley (薏米) as its base, the milky soup also contains tofu skin (腐竹), ginkgo nuts (白果) and snow fungus (雪耳). The cold version of this dessert costs RM1.00 more because it involves more preparation. The cooked soup is chilled beforehand, and then poured over shaved ice to produce a slushy consistency. This icy dessert needs to be consumed quickly because it becomes too dilute when the ice melts. Yuen Yang Paste (生磨鸳鸯糊, RM6.50) combines two crowd favorites: black sesame paste (黑芝麻糊) and peanut paste (花生糊). Black sesame paste is roasted and ground from actual sesame seeds, and then boiled to a certain thickness. Meanwhile, peanut paste tends to be sweeter and has more buttery appeal despite the fact that no oil is added. Black Sweet Rice Soup (黑糯米粥, RM4.20) is a Nyonya (Peranakan) specialty based on black glutinous rice (黑糯米). This dessert is considerably dense and is quite filling. For aesthetic appeal, coconut milk is used to produce a web-shaped "latte art". Bo Bo Cha Cha (嬷嬷喳喳, RM5.50) is another classic Nyonya dessert. Made from taro (芋头) and three types of sweet potato (番薯), the soup is particularly starchy. 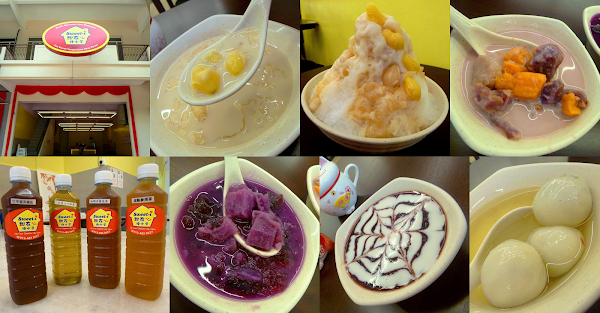 Also present are jelly-like tapioca flour (薯粉), black-eye peas (眉豆), sago pearls (西米) and coconut milk (椰浆). Peach Resin Purple Sweet Potato Soup (紫薯桃胶西米露, RM5.50) derives its alluring color from purple sweet potatoes (紫薯). The soup is occasionally punctuated with jelly-like peach gum (桃胶) and sago pearls. Tangyuan (汤圆) is glutinous rice balls with sweet fillings. There are three types of fillings: peanut (花生汤圆), red bean (红豆汤圆) and black sesame (芝麻汤圆). Tangyuan can be ordered à la carte (RM6.30 for a bowl of 3 pieces) or as an add-on (RM2.00 each) to other desserts. As for chilled desserts, Lemon Pear Sea Bird Nest (雪梨柠檬海燕窝, RM5.80) draws substantial citrus tanginess from lemons. Meanwhile, snow pear (雪梨) lends its natural sweetness. Bird-nest seaweed (海燕窝) has mostly disintegrated into the soup, although its pulpy consistency is still present. The sugar content of this dessert is kept minimal, making it excellent in quenching thirst. Sweet-i also produces a handful of herbal teas (养生茶水) that have specific health benefits. Today's drinks are Longan & Ginseng Tea (龙眼参须茶, RM6.50), Cassia Seed & Chrysanthemum Tea (决明子菊花茶, RM3.50), Milkvetch & Jiaogulan Tea (北耆七叶胆茶, RM5.00) and Chinese Liquorice, Perilla & Mint Tea (甘草紫苏薄荷茶, RM3.50). The preparation of such drinks requires sound knowledge of Chinese herbal medicine. Sweet-i has developed an online shopping portal where customers can place their orders ahead of time. This is especially helpful for take-away customers as D'Piazza does not charge for parking for the first 15 minutes. Directions: Sweet-i is located at D'Piazza in Bayan Baru. The restaurant is adjacent to BlackBall. Outdoor parking and basement parking are available at D'Piazza.